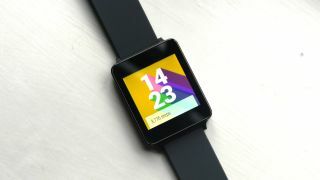 Android Wear is getting an update as the Apple Watch release nears and Google gets a little worried that it might be overtaken. The update brings with it an always-on screen, something we've seen before on Android Wear watches for faces, but the new update means you can use apps and keep them on at the same time so you won't need to flail your arms around to turn them on. However, the screen is only full colour when you're looking at it, so it won't eat as much of the battery as you might expect. Another big new feature is Wi-Fi support, which means those smartwatches with built-in Wi-Fi connections can connect to a network and still receive notifications, send messages and use any apps you want. Another new feature allows you to use your Android Wear watch while your hands are full as you can now flick your wrist to scroll through news and notifications. Last but not least are emojis, which also join the party. You'll be able to draw the outline of your desired emoticon and and Android Wear will work it out and send it to whoever you so wish. The update is launching from today and will be rolling out to all watches over the next few months. Owners of the LG Watch Urbane are up first but it's not clear which watch will get the update next.